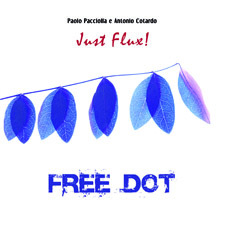 Just Flux!, which follows Ariband (SLAM 2010), the first recording of the duo, is a project of improvised music based on a set of musical instruments and musical objects. No scores, words or any other suggestion was definied before playing. Just flux! Flutes (flute, piccolo, alto, bass…), drums (daire, daff, tombak, bodhran, maroccan tabla…) berimbao, mbira, Jew’s harp, a set of stones, steel lids, bells, nuts, reed and shell rattles…and the piano, played directly from the strings and used as resonant witness. The notes say this is a project of improvised music based on musical instruments and objects, hence the titles of the tunes, which just describe the instruments.I actually like this idea, not being a fan of song titles which don’t mean anything. And this is a duo,which I also like. And just a technical note, the drums are mainly handdrums, not a drum set. When I first started listening I thought that the music was South American, especially with some of the flute playing, and drumming, or Asian, especially when the bamboo flute and gongs are used, or mid eastern when minor scales are used, so I had to check where Lizzanello is. changes. To my ears, this CD should be listened to as one long track with changing instrumentation, rather than as different tracks. Most of the CD is quite mellow, though, as in “stones,pot lids” there is more active drumming. And Pacciolla’s c flute, definitely has some jazz influence. I really enjoyed “Jew’s harp” not having heard that instrument played in a jazz context since Dizzy played it back in the 80s. The interplay between Cotardo and Paciolla is excellent. There were sections which worked so well they could have been composed, but that is the beauty of improvisations between players who listen carefully to each other. Downtown Music Gallery, Bruce Lee Gallanter.Featuring Antonio Cotardo on flutes and Paolo Pacciolla on mbira, daire, jemback, bells & voice. ……. Both of these musicians are Italian which is also where this disc was recorded in February & March of 2009. This is a splendid, well-balanced recording of mostly flutes and hand percussion or thumb piano. The hand percussion includes a daire which is a large tambourine and a jembak is a large hand drum played with a brush or just hands. The daire is featured on “Rengil” and it sounds much like a frame drum, the sound is similar to Steve Gorn and Glen Velez, who play similar instruments. At times Paolo sounds as if he is playing thin sticks or rustling leaves giving the duo a most enchanting, sublime afterglow. Antonio over-dubs another flute or two thus adding an eerie, ghostlike vibe to their sound. The persistent use of bells sounds like chimes being moved by the wind, thus also adding a dream-like quality. 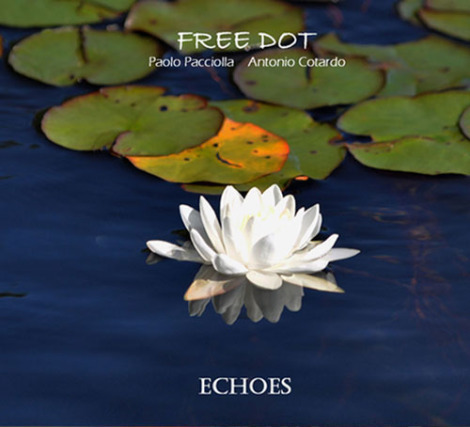 One of the great things about this disc and duo is that Paolo often plays his percussion in a most melodic way, the way a great tabla player also assumes more than just the rhythmic role when he or she solos. Ariband is/are one of those enchanting duos I’ve heard in a long while, occasionally soothing yet consistently mesmerizing. NAFDA Newsletter, Scott Robinson. Some may know Italian percussionist Paolo Pacciolla from AP Percussion ….. 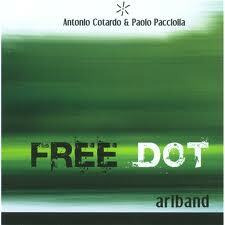 This CD features his duo Free Dot with flute player Antonio Cotardo – a very fine musician. The recording quality and performances are just great on this CD with compositions being offered by each of the musicians……If you are unfamiliar with these musicians don’t let that stop you – this music will appeal to a wide variety of listeners and will satisfy those seeking depth and vision balanced with heart and feel in the music they enjoy. 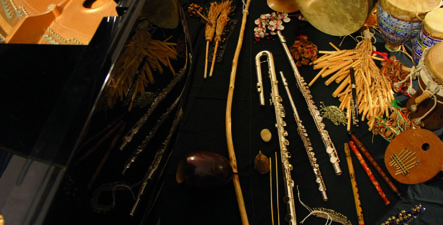 The flute and percussion are featured equally throughout with both sensitive musicians providing a give and take – taking the music to exciting places and allowing it to breath in sensitive moments. What strikes me most about these musicians is their unique musical identity – it’s unidentifiable in terms of place. Being both Italians, you wouldn’t know it listening to the music. It’s almost jazz but from where I can’t tell. The flute is clear and well played – not quite classical and not quite jazz but not light or forgettable. My attention was grasped from the moment I heard the 1st track – who are these guys? They sound fresh! Not overbearing, never pointless – there’s a musical sensitivity that is perfect throughout each piece on the CD. Pacciolla’s frame drumming – lap style, hand held, bendir, daire – is well done and complimented by his mbira (kalimba),brushes, other percussion, and voice throughout. This is the kind of world music that lovers of Codona and Hadouk will gravitate to – again and again. The music has a strong organic feel with the production more natural allowing for the variety of flutes and percussion to sound well but never larger than life the way some modern recordings tend to accentuate. It’s very apparent that this CD will grow upon the listener who at once can enjoy its sincere fresh breath of a voice and revel in its offerings as they become close travelling companions the more you listen to them. Punto libero di Vittorio Lo Conte. Chi ha ascoltato la musica di Stephan Micus prima su Japo e poi su ECM, con ogni volta sulle copertine un lungo elenco di strumenti delle tradizioni di paesi così lontani l´uno dall´altro, sarà rimasto sorpreso da quello che è riuscito ad inventare anche grazie alle tecniche di registrazione e sovraincisione che negli anni sono migliorate. Oppure Don Cherry ed il trio Codona, che ha lasciato le sue importanti tracce su tre incisioni anch´esse per la ECM. Un genere che ha un suo fascino, che mette insieme cose che di solito non si incontrano, idee che spuntano durante viaggi lontani e che poi si catalizzano durante il lavoro in studio di incisione. È una lezione ripresa da due musicisti italiani: Antonio Cotardo, alle prese con dei flauti etnici, e Paolo Pacciolla, che suona tamburi e percussioni che vengono dalla tradizione dell´Iran e dell´India, da lui studiata con in maestri del luogo, oltre ad invenzioni proprie, come quello che ha chiamato jembak, un tamburo a metà fra il djembé ed il tombak, che suona con una spazzola da batteria. Durante mesi di preparazione, ascoltando, avvertendo quello che i suoni volevano comunicare, levando, aggiungendo tracce, note, alla fine sono arrivati a celebrare un incontro che in fondo è antichissimo, quello di flauti e tamburi, qui possibile grazie alla tecnologia ed ai viaggi. Un incontro così è qualcosa di speciale, che prende subito l´ascoltatore, un´atmosfera sciamanica da cui ci si stacca malvolentieri perchè c´è qualcosa di ipnotico in quello che i due propongono. È come un fumo che lentamente si innalza e prende con sé in un immaginario viaggio dei desideri. L’immaginazione dolce di Dinko Fabris. Il giornale della musica n.284, settembre 2011. Un viaggio affascinante in una sonosfera immaginaria e incontaminata, lontana dalle brutture e dalle ansie della vita quotidiana: ma non si tratta dell’ennesimo prodotto di world music e meno che meno di tappezzeria New Age. Sotto la denominazione di Free-Dot due giovani musicisti salentini hanno unito le loro forze per avviare una ricerca comparativa e associativa sui suoni e sulle culture.…una via dolce e gradevole alla sperimentazione sul suono.